We offer tube fittings in single ferrule and double ferrule configuration. a wide range of style and sizes are available. for easy selection this are categorized in metric and imperial tube sizes. 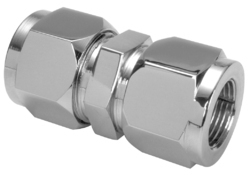 Tube fittings covers various styles like male connector, female connector, union, elbow, Tee, Cross Tee etc to cover almost all combination of piping requirement. 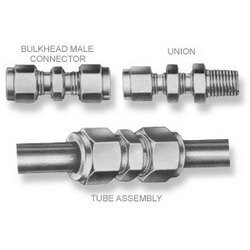 we also offer customized end connection to meet user requirement of these fittings. Being an industry leader we offer Tube Union to our customers. Manufactured using high quality raw material, these tube fittings are well known in the international market for its accurate design, high performance and sturdy construction. In addition, they are offered at reasonable rates. Being a quality centric organization, we offer supreme quality flare less Compression Tube Fittings to our valued customers. Our range makes a spring action for easy usage. They are available in a size of 3 millimeter to 50 millimeter to our clients. These products are manufactured using SS tubing, M.S, stainless steel, M.S. copper and brass as per AISI 304, 316, 316-L, Brass, EN8, M-S, Monel etc. Testing Methods as per Nuclear Power Corpn of India Ltd. ( No.PP-E-577). The expert team of our company offers Female Connector. They are fabricated with the latest machines using high quality raw materials. Our range is widely renowned for its quality, durability and outstanding performance. Understanding the needs and requirements of our clients we offer customized solutions of Single and Double Ferrule Tube Fittings to our clients. Looking for Tube Fittings ?